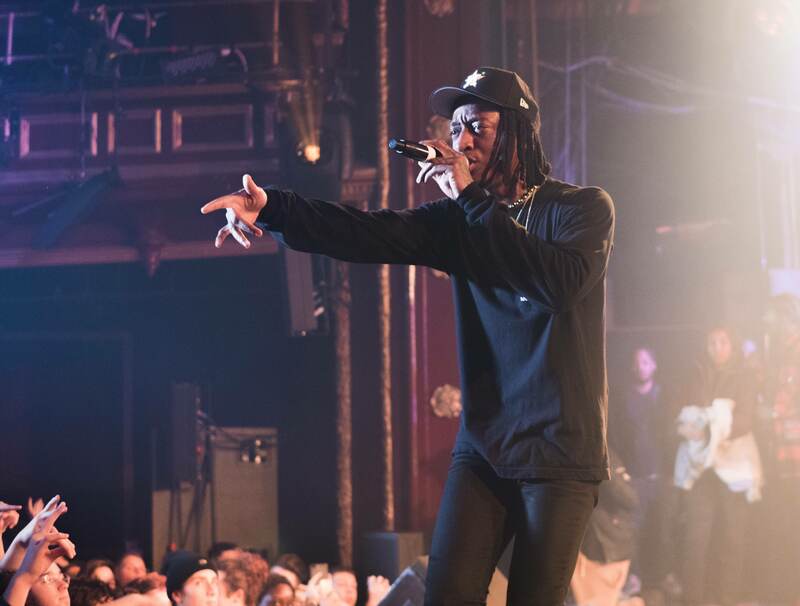 Derek Wise and 88Camino, better known among attendees as hip hop duo 88GLAM, hit the stage of Le National last Sunday to a full house of screams and applause. Decked in black from head to toe, rocking a Chrome Hearts tee and Montreal-based Malice World cap, the Toronto natives felt at home as they performed their newest tracks to a familiar crowd. The rap collaborative gained traction after the release of their first eponymous mixtape in 2017, which starred their breakout hit “Bali” featuring Nav. Months later, their mixtape was re-released with four additional songs, along with the news that they had been signed to The Weeknd’s record label, XO. The duo have since released their second project, 88GLAM2, and are nearing the end of their tour with the same name. Following two opening sets by local Montreal rappers Hardbody Jones and Mike Shabb, the Glam boys hit the stage with their lead single, “Lil Boat,” that most recently peaked at No. 8 on the Billboard Canadian Hot 100. 88Camino was first on the mic as he began to rap the chorus. The artist’s soft, auto-tuned, sing-song voice is complemented nicely by Wise’s deeper, darker verses. This applies not only to “Lil Boat” specifically, but to the duo’s sound as a whole—which is the core of their catchy and melodic tunes. As is expected, a mosh pit was requested of the crowd half-way into the show. The performers waited on stage while the crowd opened up a pit that they would soon rush into. Having practiced their moshing skills hours before during Hardbody Jones’s set, the mob of eager, sweaty bodies readied up with a perfectly shaped circle. As the opening notes to “GPS” started playing, the crowd waited for the beat to drop and then unleashed their friendly fury. The performers were pleased with what they started. At one moment during the night, 88Camino whipped out his phone to take a video of a fan on someone’s shoulders as she lifted up her shirt to show the “XO” tattoo on her ribs. As their set neared its end, Wise and some affiliates picked up a 24-case of water bottles tucked away behind a curtain to the left of the stage. They began to distribute them to the crowd. They requested that the water bottles not be used until the next song had begun. Then, Wise rapped the familiar words, “Time to turn the heat up like it’s Bali.” Within seconds, more mosh pits broke out, more screams were heard and more energy vibrated the building than any time before. And water. Lots of water. By the time 88Camino’s chorus had begun, the stage, the artists and the crowd were drenched in water. As they wiped a mix of sweat and water from their foreheads, Derek Wise and 88Camino walked off stage with smiles on their faces, knowing that 88GLAM had once again turned up the heat in Montreal.